I'd watched A Man Who Knew Too Much a long time ago when they showed it on Doordarshan. All I remembered of it was the famous Que Sera, Sera and that it was sung by a woman at the piano. I'd even forgotten that she was Doris Day. The only other scene I remembered of it was James Stewart climbing out of the bell tower. So I put it on my Netflix queue, since a mystery that you have watched but do not remember, is worth watching all over again. Dr Benjamin McKenna (James Stewart) and his wife, Josephine (Doris Day) are on vacation. Ben had a medical conference to attend in Paris, and he's decided to show Jo and his son, Hank (Christopher Olsen) the places he was stationed in during the war. So they have made a detour to Morocco, after having 'looked in' on Lisbon and Rome, and are now travelling from Casablanca to Marrakesh. On the bus trundling through the countryside, Hank as an 'incident' - one from which he is rescued by a friendly Frenchman, Louis Bernard ( Daniel Gelin). Thankful to have their son escape what could have been a nasty experience, the McKennas get to know Bernard better. But as the journey progresses, Jo is suddenly suspicious. Why is Bernard asking so many questions of Ben? And why, when they are waiting for a taxi to take them to their hotel, does she see Bernard talking to the man from the bus? Ben scoffs at her suspicions. She is only upset because Bernard didn't ask her anything about her life. Jo is not so easily reassured, but she resolutely puts away her misgivings. Until they reach the hotel and she finds a couple, strangers to them, staring at them very curiously. But Ben doesn't have any patience for his wife's fears - they must have recognised her, he says. After all, she was a famous singer once. Bernard has offered to take them for dinner that night, and Jo gets Hank ready for bed, while Bernard joins them in their room for a pre-dinner drink. Jo tries to get him to talk about himself and is made even more suspicious of his evasive answers. When she asks him what he does for a living, Bernard says, 'I buy and sell.' And what does he buy and sell? 'Whatever gives me the best profit.' Jo's suspicions that Bernard is not what he seems to be are crystallising. 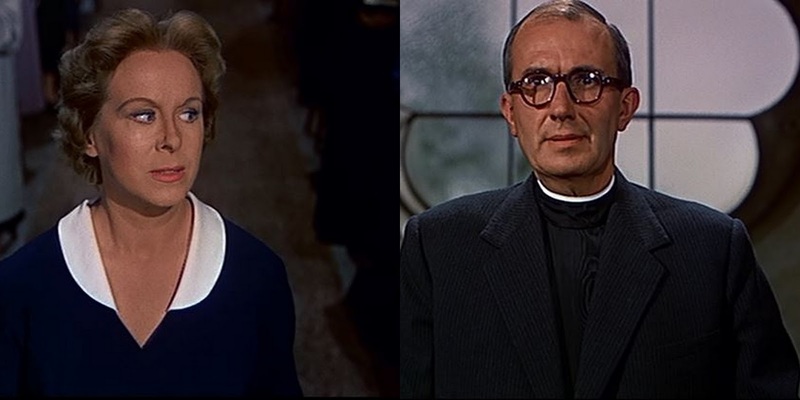 It hardens when she sees Bernard's reaction to a knock on the door - a sinister stranger begs pardon for having knocked on the wrong door. It is obvious that his arrival has discomposed Bernard. He asks to make a quick phone call, and then, apologising, cancels their dinner plans and leaves. At a loss for this strange behaviour, Ben and Jo go out for dinner where they meet the couple from the hotel, who introduce themselves as Lucy (Brenda da Banzie) and Edward Drayton (Bernard Miles). Edward is here in Marrakesh, working for the United Nations, and Lucy claim to have recognised Jo as Josephine Conway, the famous American singer. As they sit down to dinner together, Ben and Jo are taken aback to see Bernard enter the restaurant with a lady companion and sit at another table. He ignores them completely, and Ben, at least, is furious at his rudeness. The next day, the McKennas decide to explore Marrakesh, accompanied by the Draytons. While there, they spot an Arab being chased by the police. Suddenly, he is stabbed by another man in a bournous; he staggers into view, and a few feet further, he collapses. As a doctor, Ben goes to see if he can help. As the stain comes off on Ben's palms, and the hood falls back, he realises that the man is Louis Bernard. The dying man whispers that a foreign statesman will be assassinated in London very soon; Ben has to tell the authorities about a man called Ambrose Chappell. The police (who had gone chasing after the murderer) have a lot of questions - who was the man who just died? Who is Ben? How did he know the dead man? What did the man tell him? Could he please accompany them to the police station? Edward offers to accompany them and act as translator while Lucy says she will take Hank back to the hotel. Ben is truculent. He is just a tourist on vacation. He doesn't know who the man was; he'd only met him the previous night. And why should he answer anything anyway? The officer in charge informs him that Bernard was an officer with the French Intelligence and he was on the track of some very dangerous people. Just then, Ben receives a telephone call. Edward, to whom Ben mentions his apprehensions, tries to get in touch with Lucy at the hotel, and is worried himself when there is no response to the front desk calling their room. He offers to go see for himself, while Ben wraps up at the police station. When he returns to the interrogation room, Ben flatly refuses to answer any more questions. Taking Jo, he returns to their hotel where he learns that not only has Lucy not returned to the hotel, but that Edward has checked out. Something is seriously wrong. When they reach their room, Ben medicates his wife before telling her the truth - their son has been kidnapped. As Jo lies drugged, Ben packs. He's also had the concierge check other hotels to see if the Draytons have checked in there, but they haven't. When Jo regains consciousness, Ben tells her they have to return to England; that is where the Draytons have gone with Hank, if Ben's information is correct. Fearful for Hank's safety, they daren't approach the police, for fear the Marrakesh police will connect Hank's disappearance with Bernard's murder. In London, they are met by Inspector Buchanan (Ralph Truman) of the Scotland Yard, who has been intimated of their arrival by his counterparts in Marrakesh. There is also one other person who is very interested in their arrival. The Inspector is not a fool. Even though Ben tries to hide the truth from him, Buchanan makes it clear that he knows that Bernard had the information he had set out to obtain, and had confided in Ben before he died. Hank was kidnapped so Ben would keep his mouth shut. But his attempts to scare Jo into telling him what Bernard said is foiled by Ben, who is terrified that Hank will be in worse trouble if they confide in the police. Their conversation is interrupted. This time it is a phone call for Jo - from Lucy Drayton, who lets Jo talk to Hank. In the adjacent room, Buchanan and his men are listening in on their conversation. Realising that Ben is more than determined to keep the secret, Buchanan gives them his card. If they change their minds? The McKennas check into a hotel, and try to trace Ambrose Chappell. While Ben goes to the address, Jo is forced to remain in the room because her old showbiz friends have come to meet her. They find Jo very distracted, until one of them mentions a chapel. That is when inspiration strikes Jo - it was not a person that Bernard was referring to, but a place! With her friends' help, she finds the address and decides to go there herself. Leaving a message with her baffled friends for Ben to follow her when he returns, she makes her way to the chapel. Ben, who's had an unsuccessful and trying day so far, returns to find Jo missing; her friends explain, and one of them finds the address of the place again. Ben rushes off again with a quick apology, leaving Jo's friends even more baffled at the couple's strange behaviour. Meanwhile, back at the chapel, Lucy Drayton is checking on Hank, who's imprisoned in one of the upper rooms. She is rather gentle with him. When she joins her husband, who is now disguised as a priest, he is detailing their plan to the assassin, Rien (Reggie Nalder), [the sinister man in Marrakesh] right down to the precise time that he must shoot. Rien will get only one chance to do so without being noticed. Meeting Jo outside the chapel, Ben and she enter the chapel slowly and sit at the back. They discover Edward Drayton leading the service, while Lucy is passing the collection plate around. She recognises them as soon she sees them, and signals to Edward, who ends the service abruptly. While Jo slips out to fetch the police, Ben confronts Edward; Lucy hurries away to take care of Hank who's being held prisoner upstairs, while one of their accomplices knocks Ben out cold. They then lock the chapel doors and stay hidden while Jo is trying to convince Scotland Yard to come to her help. When she asks for Inspector Buchanan, she is told that he is on his way to the Royal Albert Hall. But his assistant promises to send the Woburn special branch to her help. With the door locked and no one in sight, and with no search warrant, the police cannot break in to the chapel. A distraught Jo decides to go to the music hall. Once she leaves, the Draytons and their accomplices smuggle Hank into a foreign embassy. It is now very clear that the ambassador of the foreign nation is a conspirator, probably the leader of the plot to assassinate his Prime Minister. Everything is set for the climax. Ben is still locked up in the chapel; Jo is at the Royal Albert Hall, and while she doesn't spot Buchanan, she does come face to face with Rien. She's reminded once again that Hank is still in the custody of the Draytons, but there is a man's life at stake, and the music has begun playing. Hitchcock didn't care too much about 'realism', just about what he could make you believe while you were watching his film; that is very much the case in The Man Who Knew Too Much. That was Hitchcock's greatness, because in all his films, the suspense is not 'Whodunnit?' nor even how he did it because you, as the audience, are shown how it is done and why and where and when, and in some cases, you even know the 'who', but how it's all going to play out in the end. The Master of Suspense does what he does best - take our deep-rooted anxieties about simple, ordinary things and cloak them in suspense and drama. Here, it is a child being abducted, and having your average couple on vacation get embroiled in murder and international intrigue. Doris Day was signed on only because of Hitchcock's insistence on having her on board. She was incredibly good as 'Jo' McKenna née Conway, a famous singer who has retired from the limelight to be a doctor's wife. She is more aware of her surroundings, more suspicious than her husband, who epitomises the clueless American. It is she who points out that Bernard has found out all about them thanks to McKenna's patter, while he remains tantalisingly enigmatic. It is she who tries to convince her husband to go to the police after they have exhausted all other avenues to find Hank. James Stewart, a Hitchcock regular, plays her husband Dr Benjamin McKenna. He's not at his best here, and the bumbling, good-natured character is one he's played many a time, but he is eminently watchable nevertheless, especially as the father who would do anything to save his boy. A remake of his 1936 film of the same name, it is said that Alfred Hitchcock only remade this film because he owed Paramount a film to fulfil his contractual obligation to them. Rewritten by John Michael Hayes, who was asked not to watch the original, the 1956 version is much longer than its predecessor. The only outdoor shots were those shot in Marrakesh, Hitchcock preferring to shoot in the studios where he could control all aspects of filming. 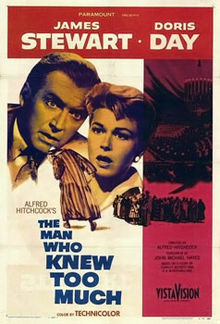 Like all of Hitchcock's movies, the climax is a tension-filled 12-minute-long sequence at the Albert Hall, London (only the exterior shot is of the real Albert Hall; the scenes inside the celebrated music hall were actually shot in a well-made set in Paramount Studios), with a performance of Storm Clouds, a cantata by Arthur Benjamin, that was written for the original 1934 film, conducted by Bernard Hermann, Hitchcock's frequent collaborator. Doris Day got to sing Que Sera, Sera, an original song by Jay Livingston and Ray Evans. It won the Academy Award for the Best Original Song. According to Livingston, he originally heard the phrase Che sarà sarà (where it is used as a motto of a fictional Italian family) in the 1954 film The Barefoot Contessa and jotted it down as a title for a future song. And finally, for Hitchcock lovers who love to spot the Master in his cameos, here he is (second from the left), in the marketplace at Marrakesh, watching the acrobats along with his stars. I love all the films Hitch made in the 1950s. I mean I know them deeply enough :). Even the lighter ones, like the film you have discussed , or To Catch a thief, mainly because of the outdoor shooting. Specially nice about them is that Hitch captures the locale without being obsessive . As if the places are being filmed by someone who has been living there for years. He must have taken special care to ensure that the places do not look glossy - something our filmmakers will never learn. I remember my mother singing Que Sera Sera when I was very small (in her version, the last verse became Now I have children of my own; they ask their mother, "What shall I eat?"). I never realised until many years later - when I first saw this film on DD - that it was actually from a film, and that too a Hitchcock one. :-) Have seen this since (my sister gifted my parents a 16-DVD Hitchcock box set some years back, and I leapt at it even before my parents could watch it)... but somehow, the finer details of the story never stay with me. Not like, say, The 39 Steps, The Lady Vanishes or Rear Window, all of which I can pretty much recall most of. The climax, yes, and Doris Day singing while her son is held captive. But the rest tends to slip away. It's funny; I hadn't watched it for years myself. It was interesting to watch it again, because I had no memory of it, but I doubt I would watch it any time soon. Very many Hollywood directors also do not know how to frame exotic locales. Just see them filming India, for example. What you say is so true - you remember the climax (I actually didn't even remember the son being captive; just Doris Day at the piano), not much else. I knew I had watched this film before, but honestly, there was not that instant recollection while watching the film. Just plain blank. Hehe... I too have Criterion copies , esp of films by Hitch. I am a Hitch freak btw - another matter than I have been pigeonholed as an India expert, esp music, that too the Burmans and Kishore :) - , and I have multiple copies of his films, including some Criterion. Ditto for some films of Wilder and Chaplin. The Criterion copy of Double Indemnity also has the TV version, something I feel is unique. My friend Gourab Roy Chowdhury (he is on facebook, but rarely does he write) has a terrific collection of Classic Holly and World. I conduct a fundoo film quiz every year, and one of my questions last year was the two endings of Topaz. He not only answered it - literally sleeping - , but also showed me the third ending of the film ;). And all were DVDs , and not pinched from the net / youtube. Lovely review of a film I am also very fond of. I liked the quip "the clueless American". I liked Hitchcock's other bumbling hero, Cary Grant, more because his English was quite English, I was sometimes put off by James Stewart's Yankee accent, in spite of his endearing vulnerability. Hitchcock retains some element of whodunnit till the end, unlike Frenzy or To Catch A Thief where you knew it right at the beginning. But his mastery was still in creating the suspense and edge of the seat ending. This movie has somewhat longer climax than the brevity of ending in some of his great films. Is that the reason why it is not regarded among his great movies? While on this, I have read somewhere that the earlier British version of the film of 1934 was superior. As a non-expert I don't subscribe to the view, because having been hooked to 1956 version, I found it difficult to go through the older version. I would welcome your expert view, in case you plan to review the older version, too. That would encourage me to see it again. I'm totally in awe of people like your friend. I do store assorted trivia in my mind, but these guys have an almost-encyclopaedic knowledge about films. I think it is because it is really not as taut as his other films. The earlier version is far shorter, and is apparently the better one - you heard right. I haven't watched it, so I don't really know. I'm woefully aware that, like you, having watched this one, I may not be the best person to compare the two versions. But it is available, so I might watch it one day just to satisfy my curiosity. I did like this film a lot; I definitely wasn't bored, and while I was watching the film, everything looked plausible. That is the mark of a great film-maker, to make you believe what you see. Que sara sara was taught ti us in school. I used to sing it from the time I was in Class I. I always had my set of lyrics.. or the Pancham way Da Da da.. I remember details of a lot of other films, including Hitch's. This one, for some reason, I drew a complete blank. Oh, he will. He liked your RD book, and he's looking forward to the 50 songs' one.